Paul King Cavanagh started the Paul King Foundry in Johnston, RI in 1966. Cavanagh attended the undergraduate program at Providence College and graduate school at Rhode Island School of Design. The year after RISD, Cavanagh spent in Rome, Italy, continuing his pursuit of the arts through independent study. One of those experiences was helping John and Margaret Manship set up a show of art work at a gallery. In preparation for the show, they had many visits to a Roman foundry. Cavanagh had been exposed to foundry work at RISD but it was not until his experience in Rome that he really knew he wanted to pursue the trade as a life’s work. When Paul Cavanagh returned to the US he started organizing the work of opening the Paul King Foundry. Cavanagh apprenticed at Roman Bronze Works in NY and at a small sand foundry in RI. Although his true education in foundry work began when he opened his own foundry. Cavanagh could no longer depend on the systems others were using. He found he had to establish his own systems which happened only after a lot of study of the materials. As the foundry grew, Paul Cavanagh was blessed with having a very talented group of workers. Some of those talented individuals continue to work with him. Their craftsmanship and understanding of what is required rivals any work produced by any foundry in the world. Paul King Foundry has produced numerous small and large pieces over the years. Paul King Foundry monuments are found all over the US. 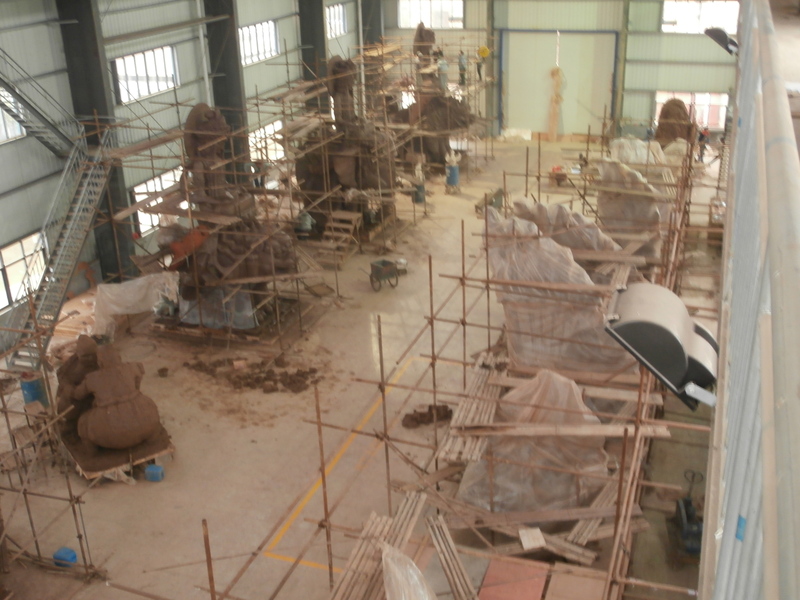 Sculpture Source Asia, The Beginning: About 20 years ago, with more than 25 years of foundry experience, Paul Cavanagh was invited to participate in starting a partnership at an art foundry in Thailand. Cavanagh looked at the opportunity as both a challenge and an opportunity. For the past few years we have been able to make available to the clients at the Paul King Foundry the economy and craftsmanship of Thailand. Three years ago Cavanagh decided to end his partnership in Thailand, while maintaining his friendship and to open an art gallery in Shanghai. It was at that time that Paul Cavanagh established his relationship at an art foundry in Nanchang, China. These relationships continue today as Sculpture Source Asia. Cavanagh spends a good part of the year in Asia overseeing production of art pieces for the gallery and for clients at the Paul King Foundry interested in the economic advantages of Asia. Paul Cavanagh, who taught sculpture at Providence College, provides instruction on good foundry methods and techniques and the principles of sculpture as needed. Khun Nok, Manager, Sculpture Source Asia, oversees quality control in the Nanchang foundry in Cavanagh’s absence. Paul Cavanagh has introduced the Nanchang foundry to the photopolymer process for bronze plaques. The photopolymers for bronze plaques is unique to this foundry in all of Asia. The workers have shown Cavanagh their ability to quickly grasp the new ideas and understand what is required to produce quality bronze castings. Most recently, Paul Cavanagh has been asked to consult with a committee regarding a 96 foot Buddha for Queen Sirikit, Queen consort of Thailand. Khun Nok and Cavanagh are also working on another monumental Buddha project in Singapore. To discover more about our Asian affiliate, please visit our sister site, or contact Cavanagh directly.